Yesterday was Yom HaShoah, Holocaust Remembrance Day. Although all year long we try to teach people about the horrors of the Holocaust, there is one day which is specifically dedicated to remembering. We mourn and honor the memory of those who perished and we pay tribute to those heroic souls who fought for freedom and survived. While Yom HaShoah rituals vary from community to community, the theme is consistent. My new friend at Baroness Tapuzina shared her thoughts and observance in her latest post. I chose to pay my respects by lighting a memorial candle in memory of those family members who I never had the opportunity to meet. I lit another memorial candle in memory of my parents who were among the fortunate ones to escape from Vienna, Austria in 1938 (one day before the Nazis invaded) and endure an arduous journey through Germany, Belgium and France, before arriving in the United States on August 1, 1939. Yesterday was a somber day for me. Although my husband tried his best to cheer me up and my best friend came over to hang out and eat Chinese take out, I couldn’t quite seem to get out of my funk. I suppose it was meant to be that way. But it’s a new day and I want to honor my parents’ memory by enjoying one of the many gifts I received from them-Austrian/Hungarian cuisine. 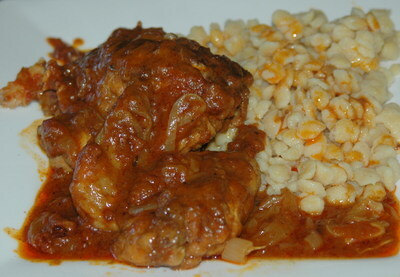 My mother’s Chicken Paprikash was one of her “go-to” meals although she would never have termed it that way. Not something an elegant, sophisticated Viennese woman would day. But I can see her standing at the kitchen counter at 186 Hemlock Road in Manhasset, New York, strongly urging me to help her prepare our evening’s meal. I rarely joined her in the kitchen because I was always having too much fun playing kick ball with my friends in the neighborhood (yes, I was a tomboy). Somehow though, her culinary skills must have been transferred to me by osmosis or something along those lines, because according to my husband, I have turned from tomboy to cook extraordinaire. Chicken Paprikash is an easy dish to prepare and my mom’s recipe, handed down to her from her mother (my Nani Klara), and was even easier because she omitted the sour cream which is always present in the classical Hungarian dish. She served it with knockerln (a form of spaetzle). I would give you the recipe for knockerln but after searching high and low for my grandmother’s recipe, I am at a loss. So I buy Maggi Spaetzle instead. I just ordered a spaetzle maker though and can’t wait to try to make it from scratch. 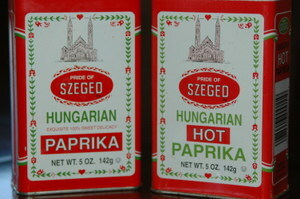 Here is the recipe for Mom’s Chicken Paprikash, incorporating my revisions over the years. Wash and dry chicken pieces. Combine flour, paprika and salt and dredge chicken pieces with mixture. In a heavy pot, brown chicken pieces in butter and seet aside. Slice onions and saute them in butter until slightly browned. Add to chicken. Add ½ cup water and cook on low for about 40 minutes. Add more salt, paprika and/or water to taste. “Good luck”- a direct quote from my mother’s recipe! •Sour cream is often added to the sauce at the end of the cooking procedure; makes it much richer and much more fattening!